Remembrance Day: It’s that one time of the year where we remember those who have fought for our freedom & those who have given up their tomorrow so that we could have ours. It’s funny how actually meeting and knowing a soldier who was injured in battle changes one’s view of the day. This year, Astral Media took in a Vet — a 34 year old who lost both his feet in Afghanistan, yet stands taller than most of us (in height and in resilience). It’s through talks with him that I learned about all the soldiers that have made it back from war, but ill or injured — so many so that the army might not have been ready for it. It’s by getting to know him that I found out about Soldier On. Soldier On was adopted by the Canadian Forces in 2007 with the aim of supporting ill and injured military personnel with a permanent and chronic disability, both still serving and retired, and their families to attain an active and healthy lifestyle. So many say that thanking soldiers once a year feels like it’s sometimes not enough… why not support them in another way this year. Operation Cooking For Soldier On is a sweet fundraiser — tasty too — and offers a perfect Christmas gift! 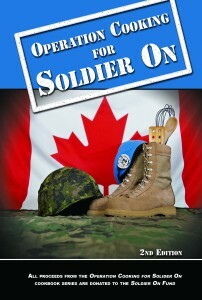 A cookbook with 250 recipes from Military members and families all across Canada. For only 12$ to 20$, you can rev up the BBQ with recipes from those who fight for us & acheive a healthy lifestyle while helping them acheive one for themselves! Take that gratitude one step further and BUY ONE NOW! I did!